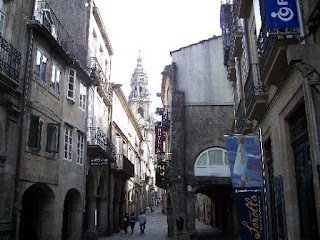 A couple of weeks ago, I posted an email from my friend Benny McCabe, who's been walking the Camino. "The Camino de Santiago is not a marathon nor a gym where you can check your fitness. It is a bank of challenges for your humility and a real lesson in your human and spiritual possibilities." It is that! Yesterday I decided not to continue to the hermitage which has only candlelight which was to be my last night before turnaround. My injured right leg said no, after 3 days of continuing with the help of anti inflamitories it was time to listen to my body, time to recuperate, to reflect, digest. As the notice says " it is the inner journey which is the important one." The outer journey has become a container within which the human condition is explored, the body is pushed beyond comfort levels, in the conversations and sharing a different consciousness is glimpsed and touched upon. Many memories, maybe one to give a taste? I had walked with mark, a young man from Canada, on and off for a few days. He had a tight timeframe to make it Santiago and we had taken our leave the previous night. Somehow we met up again the following day and walked for a few more hours. Then he said " I feel as though I have come to a crossroads. I could continue walking and talking with you for the rest of today, in fact I could continue it for the rest of my life and it would be good. 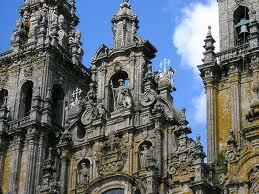 But I have to go on to Santiago and to think" I told him to go ahead. He replied " I would like to offer you a gift" I said I would be honoured. He said" Always remember whatever you need is inside of you and whenever you need it it is freely available" He then strode out with his two poles and long legs as he headed for a destination 20 days ahead. I had heard what he said many times but in that experience I got it! A couple of more reflections from the wall which I think captures what the Camino is about? 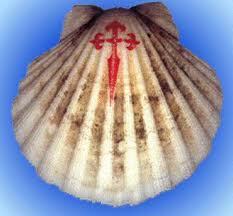 "The authentic camino is that which each does inside of oneself. This might mean that you meet your Self and it could transform your life. It is necessary to understand that time is a teacher. The most important equipment is your attitude of searching. Open your eyes to the beauty of the countryside, to the art. to those who offer you hospitality. To gratuity and generosity offer gratitude." It feels like a new relationship unfolds! Ah that is a major drag. Well here's the deal I think I'm going to make it a goal of mine to bring you to my school at some point. I'm one of the leaders of our little Newman group on campus which is slowly growing (we had a beautiful homily today and some beautiful violin playing) and I think it'd be possible. So maybe I'll e-mail you some time to see what it would take.. 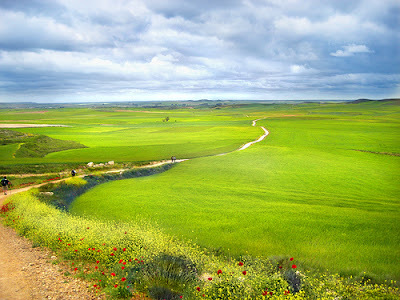 I'm reading this after seeing the Martin Sheen/Emilio Estevez movie, The Way (about the camino). All the more clearly does your friend's post resonate. AM I MY GAY BROTHER'S KEEPER?